Several Bulldogs receive post-season awards. SOUTH HOLLAND — The SSC Men’s Basketball Team defeated Morton College 76-67 on Saturday to win the NJCAA Region IV-District 4 Championship Game. 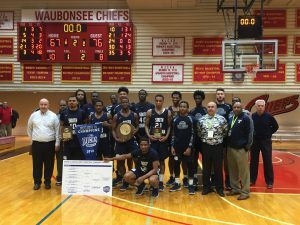 They will play in the NJCAA Division II National Championship Tournament in Danville, IL. The tournament runs from March 20-24, 2018. 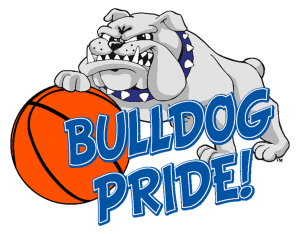 The Bulldogs are currently 28-5 on the season. It is the 9th Regional Championship won by Head Coach John Pigatti during his 12 seasons at South Suburban College. Coach Pigatti was rewarded for his efforts this season by being named Region IV-District 4 Coach-of-the-Year. It is his 9th Coach-of-the-Year award. Sophomore guard Jordan Matthews was named the tournament’s Most Valuable Player. Sophomores Jamal Bailey and Lawrence Lemon were named to the All-Tournament team. SSC Bulldogs with Region IV-A Coach of the Year John Pigatti (far left).